This past weekend, FIT NHB (Fighters In Training, No Holds Barred) celebrated their twentieth year of existence as an entity within the combat sport’s world. Not just a unique acronym, the lauded gym has been quintessential to the development and evolution of mixed martial arts in the State of New Mexico and the Southwest region. Though the event has come-and-go, our series continues on as we approach the finish line of “20 stories” to commemorate 20-years. In today’s feature, we will get to one of the wildest stories you have ever heard and definitely a deep insider’s look behind the scenes at one of the combat sports world’s most well-known gyms. Today’s feature will be narrated by one of the Head Coaches, Jon Judy. As one would expect, a combat gym will yield loads of testosterone and intensity, and that can often lead to confrontations that come in many different forms. Often it is verbal outbursts, other times it can be physical – luckily, in a combat gym, most problems can be handled easily in a protected training environment. But other times, it crosses that threshold by a mile. 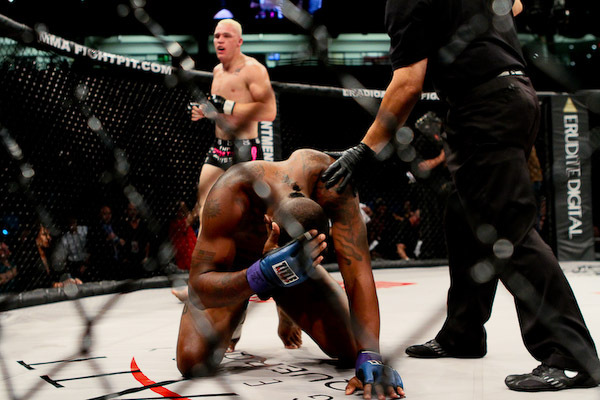 A photo from MMA Fight Pit where East dominated to a TKO finish. In order to properly prepare the context as you read this story, Charles Bennett, a.k.a. “Krazy Horse”, a.k.a “Felony”, is a storied figure in the world of MMA. His legacy may not grace the halls of the MMA Hall of Fame, but his infamy will be endless in the form of notoriously viral moments throughout his career. He started his fight career in the late 90’s, and has fought well over seventy times over the course of about 20-years. But he is a 145-pound Featherweight who has fought in-or-around that weight class and has fought notable athletes like Urijah Faber, Duane Ludwig, and Drew Fickett. He also infamously fought Wanderlei Silva in the backstage of a Pride FC event. Tyler East on the other hand is a massive heavyweight. He may not max out the 265-pound scale, but you wouldn’t know that by looking at the imposing physique. East has the look of what you’d expect a prototype fighter to look like, and he has racked up a 15-4 record capturing KOTC Gold along the way. At this point in the altercation, other than the size discrepancy, there was probably not much out of the ordinary than any other gym experiencing a scuffle among competitors. Sometimes fighters get heated, a shot lands harder than desired, emotions and physicality prevail and two fighters get to it. It wasn’t so simple on this day for Coach Jon Judy. The incident went from typical to chaos as the confrontation minutes prior had now turned a very dangerous curve as the 145-pound fighter had found his equalizer to the fighter near double his size in the form of a steel weapon. For the sake of your MMA entertainment, please take some time to YouTube “Best Krazy Horse Moments”, and watch a few videos. You’re welcome. “Felony” Charles Bennett once lifted up a fighter while inside an inverted triangle, walked to the nearest cageside camera, threw the piece sign, and proceeded to spin in place and violently flung his foe into the cage. Words do it no justice, it is a must-see moment albeit choppy video feed. With the ferocity of which Bennett attacked East, it probably surprised all those in attendance that he would willingly offer himself to authorities so easily. 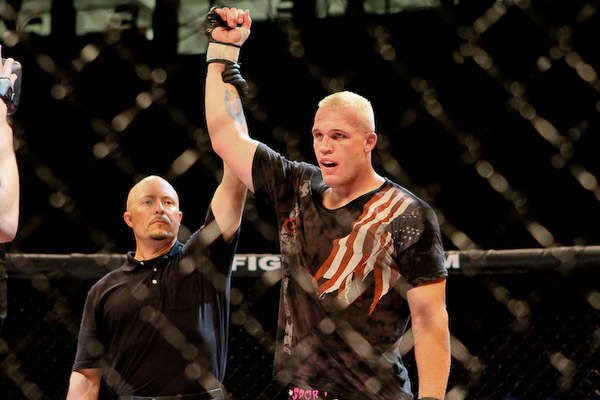 Despite being part of some of the craziest moments in MMA, he gave up at least 100-pounds on East and while that may cause concern for his safety, when he brought the weapon into the situation he had crossed a line he couldn’t cross back from. With East’s health in the forefront of importance, the situation could have been far worse. 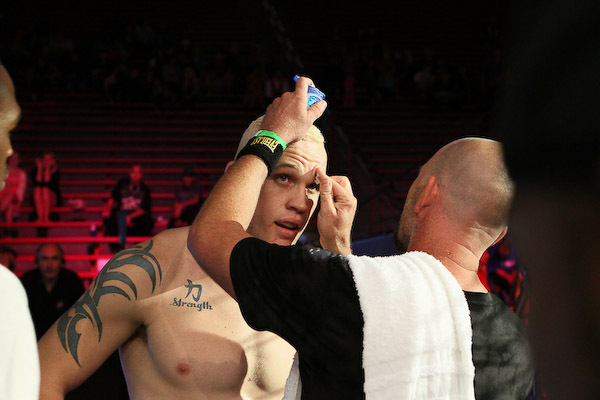 East was out for a short amount of time and would continue his success in his MMA career. The intrigue of the story is only added by the fact that Bennett lived with Coach Jon Judy. This added another wrinkle in the story being that his perspective was not only as a Coach, but also as roommate. Coach Jon Judy had the best vantage point from all perspectives for FIT NHB’s Craziest Moment.